Whitehall Training's platform was developed to meet the complex compliance-based needs of the pharmaceutical research community. Now our flexible and powerful learning platform can be used to deliver your own training. Our easy-to-use author tools give you control of the way your course looks and feels, and our flexible-licence pricing gives you total freedom to manage your in-house training. Try our author tools free for the first 30 days to see what they can do for your organisation. We will even include two test licences so you can evaluate the training in action. • Save time and money – deliver training quickly and effectively wherever the learners are located and whenever they need it. • Improve the learning experience – quickly convert your document- or slide-based training into a lively and modern online format with images, videos and web links. • Track learning outcomes – design your own end of course exam with the ability to randomly select questions from each subject covered. • Retain control of your intellectual property – protect your course material, as our system is totally secure and your courses will only be visible to those you choose. • Improve your records – if your training is audited, wouldn’t it be great to be able to say how much time each learner spent on the course, how often they took the exam before they passed, what questions they got wrong and more? • Inform your training planning – easily see which subjects are giving your trainees the most difficulty and plan future training to address the gaps. • Roll out key information when it happens – update your courses if something changes to ensure all the learners are kept fully up to date – company-wide if necessary! 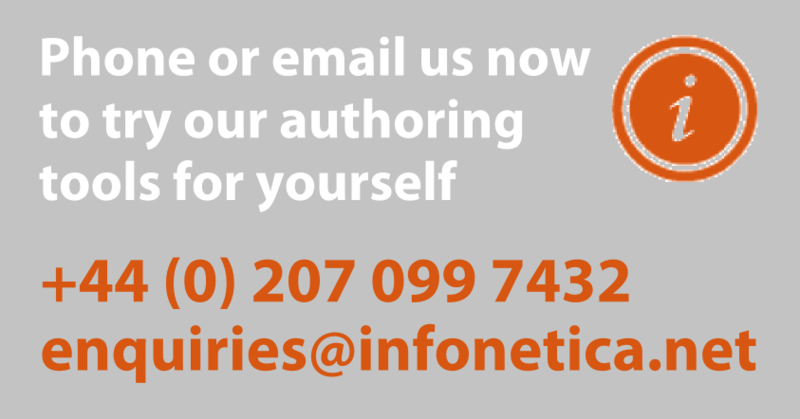 Call +44 (0) 207 099 7432 now to try our author tools.